The future of commercial aviation is booming and the future, for the next twenty years at least, looks secure for anyone entering the sector, whether as a pilot, cabin crew or in some other role. That’s clear from Boeing’s latest forecast, released earlier this week at the Farnborough International Airshow, with the in-service airliner fleet doubling in size. Boeing’s estimate of the current value of the worldwide airline industry is a staggering 15 trillion US dollars (that’s 15,000,000,000,000 or fifteen thousand billion). That’s split: aircraft (jets with 30 seats or more) $6.3T, and services (required to support commercial aviation) $8.8T. Boeing’s forecast is the most respected in the industry, and is used to a) shape product strategy, b) guide long term business planning, and c) inform suppliers and customers. Introducing the forecast, Randy Tinseth, vice-president of Commercial Marketing at Boeing, said, “More people are taking to the air than ever before, as our industry has now recorded eight straight years of steady and above-trend growth. “It is commonplace for airline passengers to hear flight attendants announce full flights, and load factors climbed to a record high of 81 percent last year. And airlines are delivering strong financial results, generating more than $30 billion of profits, unprecedented levels for our industry. “This year, we again forecast a growing demand for new jetliners, as airlines and other operators look to renew and grow their fleet to serve more passengers and carry more cargo. “These airplanes also give life to a multi-trillion dollar market for services as operators maintain, repair, and overhaul the jets to keep them flying safely and efficiently. “This sector also includes the training of pilots and technicians to operate the airplanes and the emerging field of data analytics to further enhance operational efficiency. 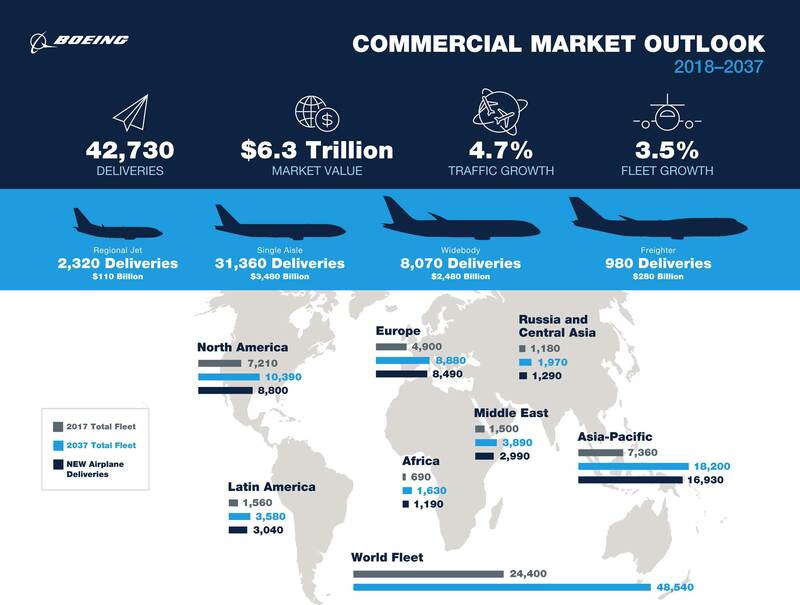 “Together, our analysis projects a global demand for $15 trillion worth of commercial airplanes and services, a truly massive market, in the next two decades. You will see this demand playing out differently in each region as operators cater to different demographic and growth trends.